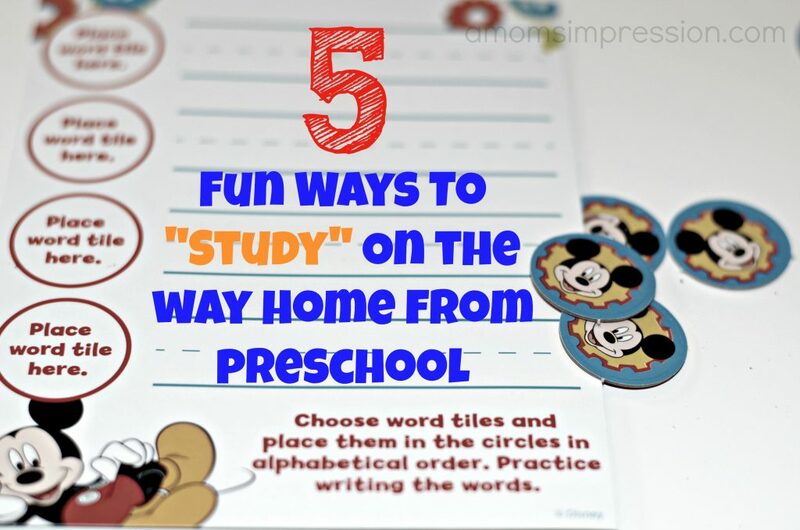 5 Fun Ways to Study on the way Home from School and Fun with Disney Junior! My son and I start school up again on Thursday. Its so hard to believe that we will have to start up our routine again. Our routine consists of a rather long commute in the morning and afternoon. The only difference this year is that Jonah will be coming to school with me so we will just have to drop Caroline off at preschool before we head to our school. Speaking of preschool, seeing as we have a long commute to and from school, we play educational games in the car that help reinforce beginning learning activities that my kids are learning in preschool. 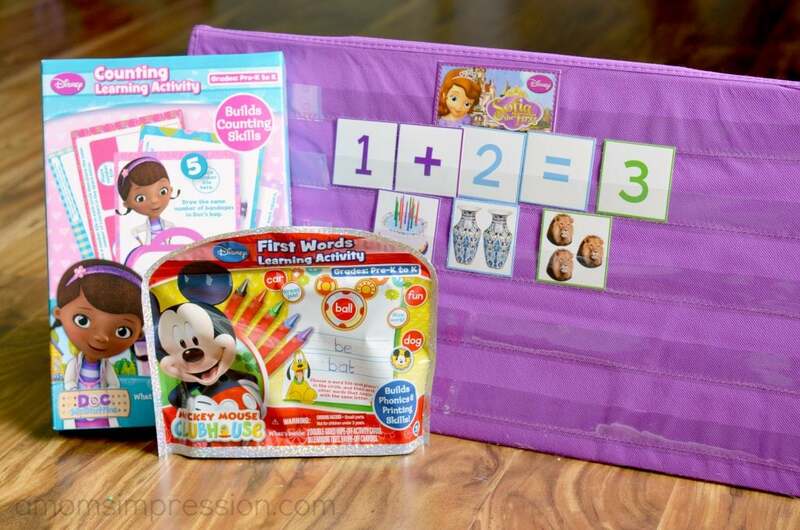 This month we added some fun products from Disney Junior into our fun car games. Disney Junior has always played a big part in both of my kids’ life at home. If my kids are going to watch television, I don’t want to have to worry about what they are watching. Disney Junior provides that for me. There is a little something for all aged kids at Disney Junior. My son loves Octonauts and Jake and the Neverland Pirates while my daughter is OBSESSED with Micky Mouse Clubhouse. She will also tolerate Doc McStuffins and Sofia the First. I love the foundational skills that my kids learn from these shows. 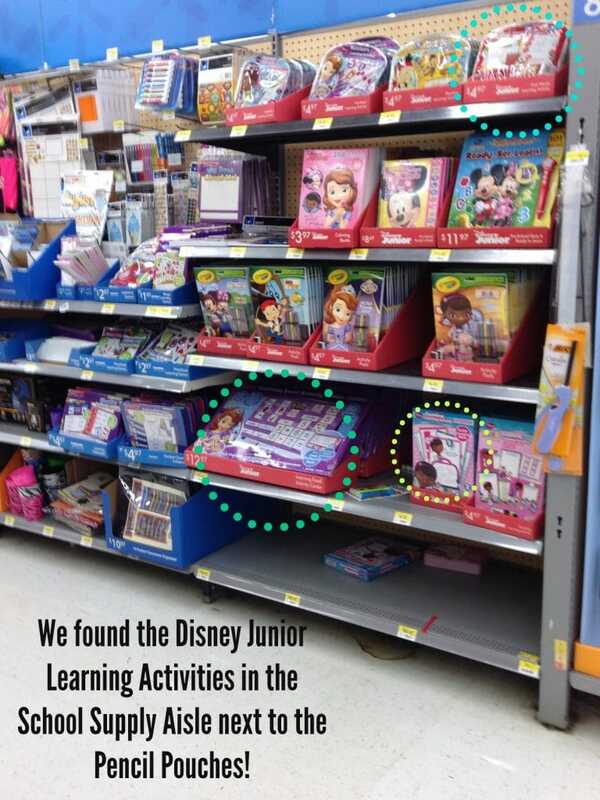 That is why I was very excited to learn that Disney Junior had come out with some preschool learning activities. Having familiar characters that my children love help get them excited for activity time! My daughter knows how to count to 14, but what she needs to work on is her one-to-one correspondence, or being able to count a set number of objects. We love the Sophia the First Learning Easel Activity Center. 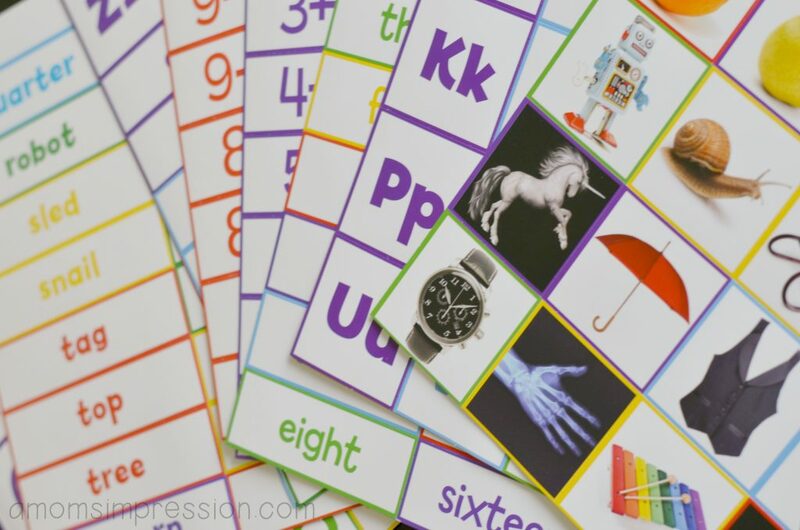 The center comes with a lot of cards that cover everything from letter identification, letter sounds, to basic math facts and counting cards. This is an activity center that I would have in my first grade classroom. There are endless activities you can do with your child with this center! We have been loving the picture cards with different amounts of objects on them. In addition to using them with the Sophia the First table top pocket chart, we have also been using them in the car when we travel. As I mentioned before, we have a rather long commute to and from school everyday. In the mornings we all kinda are waking up and relaxing, but on the way home we love to play games. I have been an early childhood educator for the past 8 years. Parents are often asking me about ways they can reinforce or work on early learning skills in a short amount of time. Little guys have a short attention span so whenever you can get a little learning in, it makes a huge impact. One way I love to reinforce early learning concepts is to play fun learning games in the car. 1. 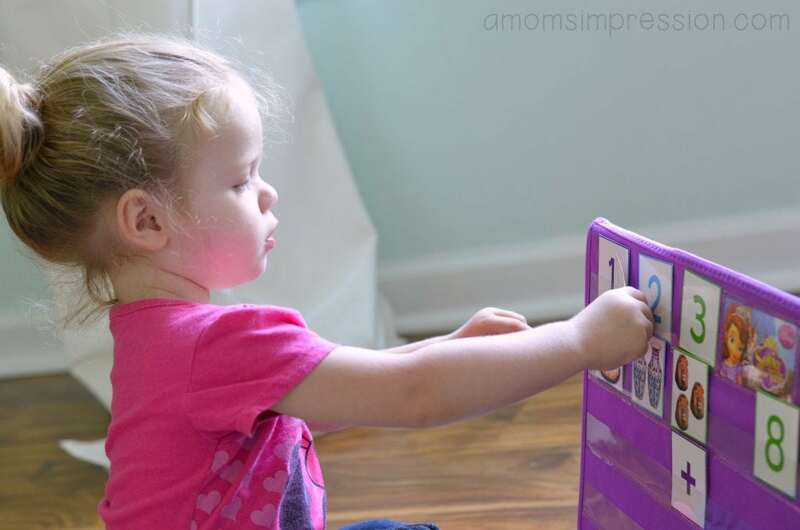 Picture cards (we love the ones that come with the Sophia the First Learning Easel Activity Center) that you can use to count a set number of objects. This is great if you have 2 children who are working on different things. One can read his books for the day while the other is using the cards to count. It is more of an individual activity. 2. Point out street signs and ask about what shape they are. 3. Do a letter hunt. My son would work on a letter every week, we would try to find that letter on street signs as we were going home. Every day that week we would try to beat the number we found the day before. He loved it! You could also do this with numbers. 4. Play a version of the I Spy Game. Instead of saying, “I spy with my little eye” say “Whoever finds a red car first wins!” Playing I spy in a car is difficult because you are moving and young kids may not find the object you are talking about before you pass it. Playing this version allows them to play until someone finds a red car or a blue “S” or whatever you want to find. 5. When your child is ready, play the sight word game where you ask your child to find the word “the” or have him spell the word using letters they find in other signs. For example, if you are spelling “the” you could find the letter T from a Target Store, the letter H on a license plate, and the letter E on a billboard. Get creative and find words they can read already and have them read them for you, like McDonalds. This builds a lot of confidence in our earliest readers which goes a long way when they are beginning to learn to read. All feature one of your child’s favorite Disney Junior characters! I love that they are also affordable. We also purchased the Mickey Mouse Clubhouse First Words Learning Activity for less than $5 as well as Doc McStuffins Counting. I was really impressed with everything that came with the activities and would recommend them to parents. How do you make learning fun after school is over? These are great tips. We homeschool, but still use tips like this when we are driving home from events. 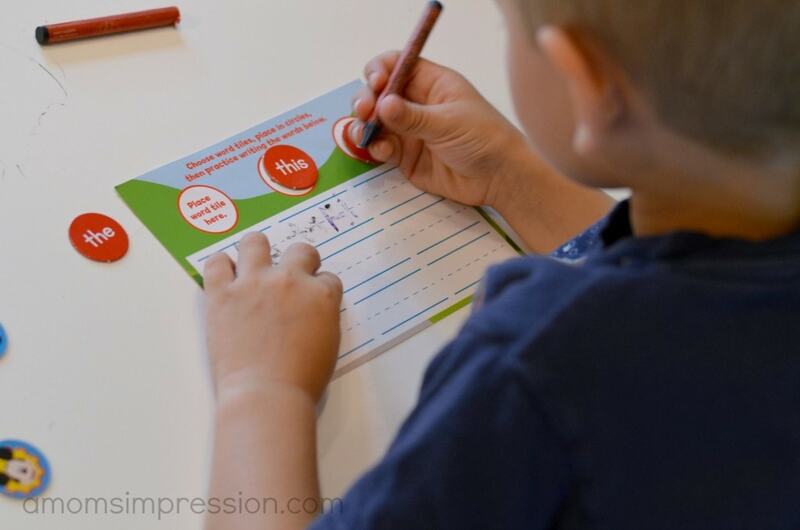 I like the letter hunt suggestion, fun and educational! How adorable and fun are these studying tools. Not only are they educational, they are adorable with Disney as well. Yes, it’s all about keeping them engaged! Going to check these out. I use to do many of these when my children were younger I would make almost everything a learning experience. You have to take advantage of teaching young kids anywhere and everywhere… while driving is a great way to learn things. Great tips! I’ll definitely have to get something like this for my daughter. She would love this!